Shuttle Endeavour's Trip To L.A. May Cause 400 Trees To Be Cut Down : The Two-Way The space shuttle Endeavour will make its final trip next month, to the California Science Center in Los Angeles. But at 78 feet wide, Endeavour can't squeeze through highway overpasses. So its planned 12-mile route must be cleared of trees in the medians and sidewalks. 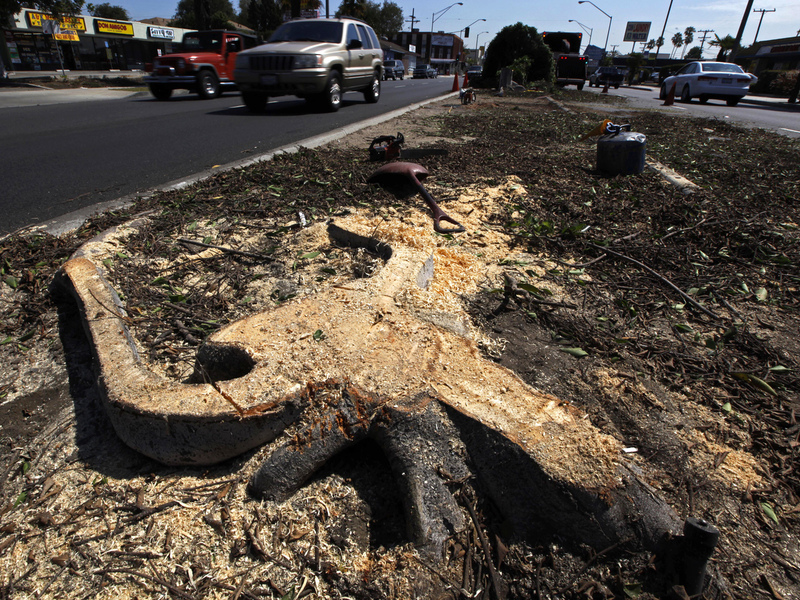 A stump remains in the median of Manchester Boulevard as workers remove trees to clear a path for the space shuttle Endeavour in Inglewood, Calif., Tuesday. Residents are upset that 400 trees might be cut down to allow the shuttle to travel from the airport to its new home at a science center. The space shuttle Endeavour will make its final trip next month, to the California Science Center in Los Angeles. But while most South L.A. residents are excited to have a piece of history nearby, many are also upset that the shuttle's 12-mile transit is forcing the city to cut down about 400 trees. Officials say they simply have no alternative to the shuttle's route from Los Angeles International Airport. At 58 feet tall and 78 feet wide, Endeavour can't squeeze through highway overpasses. And at 184 feet long, it's best to minimize the need to turn. Taking it apart was ruled out. And at 170,000 pounds, an airlift was deemed impossible. So, ahead of the Oct. 12 move date, trees are being cut down on the sidewalks and center medians along several streets, including Crenshaw and Manchester Boulevards. The route winds through Inglewood to southwest Los Angeles. They range from pine and ficus to magnolia trees. "They are cutting down these really big, majestic trees," Leimert Park resident Lark Galloway-Gilliam tells The Los Angeles Times. "It will be beyond my lifetime before they will be tall like this again." The California Science Center says it will replant about twice as many trees as are cut down. And some city planners say they welcome the chance to replace diseased trees and to repair sidewalks that have been damaged by tree roots. But residents of the area aren't happy with the prospect of losing the trees. South L.A. resident Claudine Jasmin tells KABC radio that although she is a frequent visitor to the science center, she's concerned about the trees — and the birds and other animals they support. "My parents have lived in this neighborhood since before I was born, and we have these big pine trees on our street, and I'm sure it took forever for them to grow. They are beautiful," she said. "It would be really, really horrendous to see all these years of a tree's growth completely diminished for one parade." The arguments over the trees puts Endeavour's reception in stark contrast to other shuttles' paths to museums near Washington, D.C., and in New York. In those cities, many spectators were excited to spot a space shuttle on its way to becoming a history exhibit. But crucially, those shuttles didn't have to navigate miles of small-scale surface streets on their way. Space shuttle Discovery was flown into Dulles Airport, from which it was then driven the short distance to the Smithsonian National Air and Space Museum. And Enterprise was flown to New York, where it was placed on a barge and floated its way to the Intrepid Sea, Air & Space Musuem. The shuttle Endeavour is scheduled to fly into LAX on Sept. 20.